The increase should help stabilize bait prices for lobstermen this year. 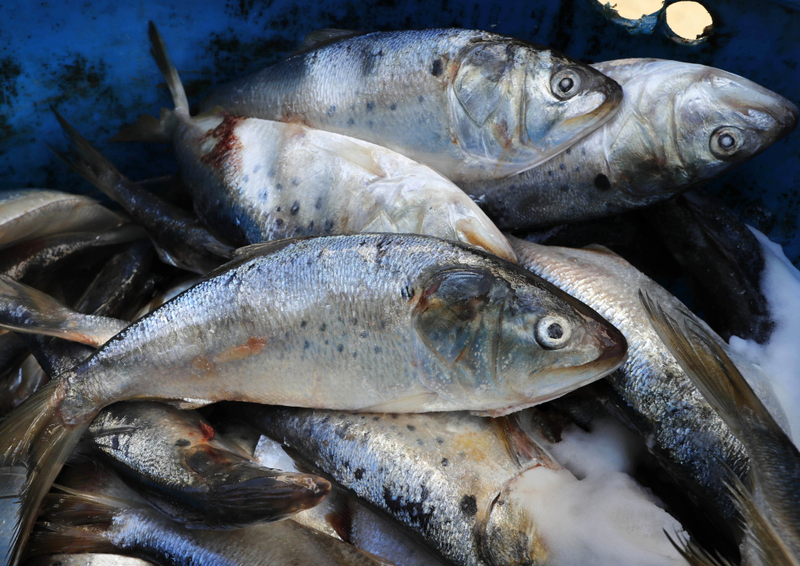 Menhaden – aka pogies – are the most popular lobster bait after herring.New rules will allow Maine fishermen to catch a lot more menhaden this summer, helping them boost and diversify their income and the local supply of lobster bait. Maine fishermen will be able to catch 2.4 million pounds a year of menhaden, an oily forage species that locals call pogy, under a reallocation of quota by the Atlantic States Marine Fisheries Commission, the regional body that oversees coastal fishery resources in the Northeast. It’s just a half percent of the total regional Atlantic States quota, but it is 13 times Maine’s annual menhaden quota from 2016 and 2017. Even the expanded quota isn’t enough for a fisherman to make a living off menhaden, but it is likely to grow the number of Maine fishermen who rig up their boats and participate in this traditional purse seine fishery. Seventeen harvesters fished for menhaden in Maine last year, state officials say, with almost all of it ending up as lobster bait. 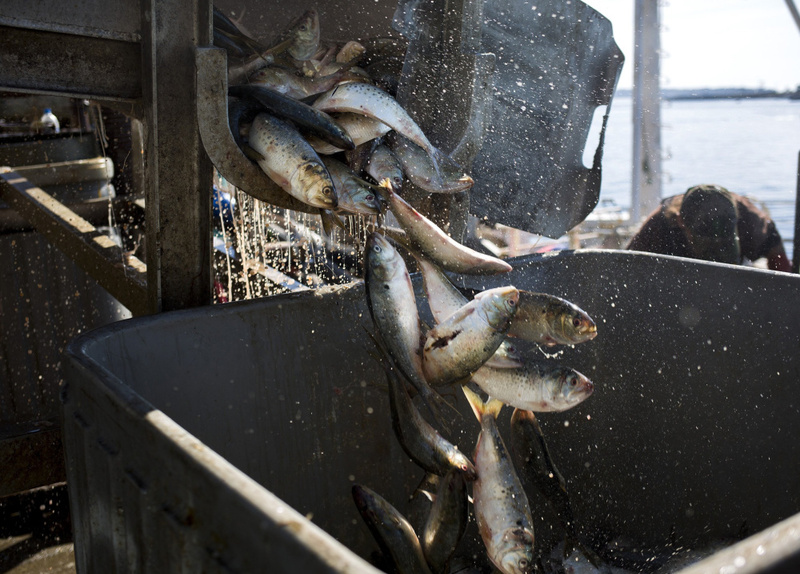 In other states, the menhaden catch heads to Virginia, where it’s turned into fishmeal and oil. The increasing quota means some lobstermen may start fishing for their own bait. Some may set lobster traps one day, haul their traps the second, and then rig a purse seine and fish for bait on the third day. In summer, they may fish for pogy on Sundays, when state law forbids them from hauling their traps. Or they may fish off the back of their boat with gill nets for the next day’s bait while steaming out to or back from setting or hauling their traps. Even those lobstermen who don’t fish for their own bait will enjoy the benefit of the lower prices likely to accompany a plentiful supply at local bait shops, Keliher said. Maine is not the only state that will see its menhaden quota increase in 2018. The commission increased the total allowable catch for the region from 200,000 metric tons, or 440.9 million pounds, to 216,000 metric tons, or 476.2 million pounds. It redistributed that catch among the states, giving each one at least half a percent of the Atlantic states catch. That redistribution helped Maine, but it loosened Virginia’s stranglehold on the fishery, slashing its quota from roughly 192 million to 112 million pounds a year. A barrel contains frozen and salted menhaden at a lobster bait warehouse in Portland in October. Environmentalists and commercial fishing groups are divided over a decision to increase the amount fishermen can catch of the ecologically vital fish. Environmental groups worry that the increase, which was the most conservative option the commission considered, represents a worrisome trend. They note menhaden have been overfished before. Their concerns were partly behind the commission’s vote to institute the first regional pogy quota in 2012. The fishery is believed to be rebounding, however, and the commission has twice voted to increase the total quota, once in 2015 and then again last November. Environmentalists argue that the commission should consider the menhaden’s important role in the marine ecosystem, serving as a key link in the food chain for both fish and wildlife, including species such as humpback whales and bald eagles. Menhaden have to be more than holding a steady population, they argue – they should be able to survive in numbers high enough to feed many other species. But many fishermen say the latest stock assessment reports suggest the commission should have increased the quota even more than it did. Last year, the menhaden arrived in May, when usually they don’t show up in any number until July, Balzano said. They came earlier last year than they did even in 2016, catching Balzano off guard, forcing him to rush to rig up his boat and round up the extra three men he would need to scoop up big balls of fish in his purse seine net. The menhaden fishery is the most exhilarating fishery that Balzano has ever worked, he said. Under these new rules, Maine could catch even more than 2.4 million pounds this year if pogies show up in coastal waters in big numbers, as they did in 2016 and 2017. The species is known for showing up in large numbers at the northern tip of its range every few years, much to the delight of predators that eat them, like bluefish. These bigger fish will drive schools of menhaden up into the warm shallows to eat them. Starved of oxygen, the pogies will die, resulting in large fish kills along the Maine shore. This cyclical uptick in local population is something fishery managers call an episodic event. When they happen, as they did in 2016 and 2017, the New England states and New York have a chance to share a quota that is set aside just for these mini population booms. Last year, Maine caught 176,370 pounds of menhaden during the traditional fishing season, plus another 3 million pounds when it showed evidence to regulators that Maine was experiencing one of these episodic events. This year, Maine can share up to 4.6 million pounds of episodic quota. Since Maine, Rhode Island and New York are the only ones to have opened an episodic fishery last year, Keliher believes Maine could add another 2 million to 4 million pounds of menhaden to its landings if the fish school here in large numbers this spring and summer. Also, once Maine has used up its 2.4 million regular quota, Maine fishermen can land up to 6,000 pounds of pogies a day while fishing for other species. The additional episodic quota is nice, but Balzano said he would prefer a higher quota for the directed fishery. A fisherman cannot depend on an episodic event, he said.